Please note these guidelines are dated from Aug 2015. From the first weekend in May - Sat May 4th, through October 1st, and on the second weekend in December (Christmas Boat Parade), a curfew will be imposed. FRI: No transit may begin between the hours of 4:00 p.m. to 9:00 p.m. SAT: No transit may begin between the hours of 9:00 a.m. to 9:00 p.m.
SUN: No transit may begin between the hours of 9:00 a.m. to 9:00 p.m. In addition, efforts will be made to avoid night time transits on the nights after the Independence Day and Christmas boat parades. Only in cases where unforeseen weather conditions, mechanical difficulties, or some similar cause, may transit be allowed within the curfew hours. These allowances require explicit permission from the Phillips 66 Dock Operator. It’s up to all recreational boaters and commercial mariners to be vigilant observers of the risks in operating on the San Bernard, which we share. 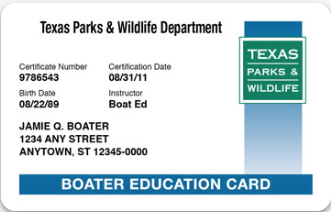 The Corps of Engineers maintains the San Bernard as a commercially navigable channel and the company's restrictions to their operations that have been ongoing for 60+ years are entirely voluntary. Continued awareness is everyone’s responsibility. BE AWARE…the Sweeny Hospital District currently provides ambulance service to the San Bernard River area and has stated it would no longer provide the service because of an annual $300,000 loss. If you live on or near the San Bernard River, Brazoria, Sweeny or Jones Creek, this will affect you. But you can vote it in…it’s on the ballot! It’s important voters from each area show up to the polls. And yes, you will have to pay a tax to create the Brazoria County Emergency Service District No. 6. The tax has been estimated to cost up to $40 a year for something that could be the difference between a life or death situation. Vote for ESD 6...If it’s not an ambulance, it could be a hearse! Friends of the River San Bernard Ranger program was held on Thursday, April 18 at Sweeny Elementary in Sweeny, Texas. The educational program was presented to 121 fifth grade science students of teachers Garland Johnson and Camille Johse. Facts presented about the San Bernard River Watershed helped students become aware of its environmental concerns. Points-of-interest along the river were identified on a map. A packet containing a FOR watershed booklet and additional river information was given to each student to take with them. FOR Ranger committee members presenting this program were Adalia and Valroy Maudlin, Mike Goodson, Bob Bailey, Ken and Linda Wright. 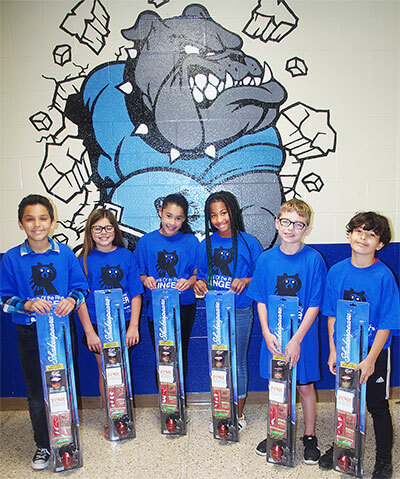 << Standing below the Sweeny ISD mascot Bulldog are the six winners of FOR Ranger rod and reels. The names of these lucky fifth grade science students were drawn at the end of the program in each class. L to r –– Thomas Paniagua, Elizabeth Liserio, Mariah Arroyos, Moriah Jones, Jake Coker and Alberto Landeres. 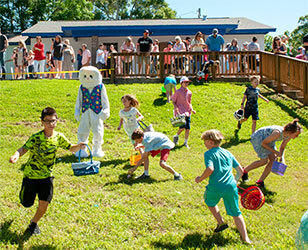 Note - be sure and click on the lower left link below "READ MORE"
Mr. P. Rabbit didn’t have to schedule a ride with Uber to get to the FOR Community Center for the start of the annual FOR Easter “Race for the Eggs” on Sat Apr 20th. Instead he arrived by water taxi chauffeured by Bob Bailey where a crowd of excited children waited for him. 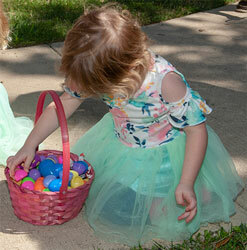 Over a thousand eggs, filled with candy and some special ones that held money, were quickly gathered up and placed in baskets. This is a free event hosted by Friends of the River San Bernard and paid for by donations to the FOR organization at the October fundraiser. Chairmen of the event this year were Wayne and Vicki Head. Note, this is a spoiler alert (don’t let your kids read this), there was a human being in the bunny costume. 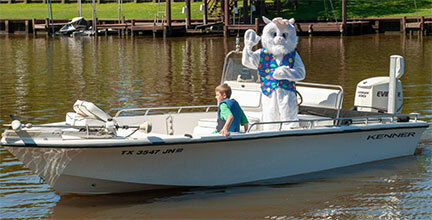 The name of the person who wore the bunny suit is Shane Davenport and his son Brayden was riding in the boat with him. Thanks Shane!